Vaikuntha Ekadashi (Also spelled as Vaikuntha Ekadasi or Vaikunta Ekadasi) is a very auspicious day observed by the Hindus. The Ekadashi is also known as Mukkoti Ekadasi or Swarga Vathil Ekadashi. What makes Vaikuntha Ekadashi Special? While all the Ekadashi’s are auspicious, Vaikuntha Ekadashi is more special because it is believed that on this auspicious day the Vaikuntha Dwar or the Supreme Gate of heaven opens. It is believed that if an ardent Vishnu worshipper or Bhakt observes a fast on the Vaikuntha Ekadashi day, it is equivalent to observing all 23 Ekadashis of the year. Vaikuntha Ekadashi falls on the Tamil month of Marghazhi or Margasirsa which occurs between the second half of December and the first half of January in the English calendar. It is believed that observing fasting on Vaikuntha Ekadashi relieves the devotee from the cycle of birth and death by which the devotee attains the eternal Moksha. Hindus across the world observe Ekadashi by fasting and keeping awake at night chanting mantras or singing Kirtans. The Padma Purana has it that Lord Vishnu fought the Demon Muran and in between retired to a cave to take some rest and create a new weapon to kill Muran. While he was sleeping, Muran got inside the cave and tried to kill Vishnu when a female form of energy came out from Vishnu and killed Muran. Vishnu was impressed by her and called her Ekadashi and gave her a boon. Ekadashi asked Vishnu to grant Moksha to all those who observed fast on that day and Vishnu happily obliged. This happened in the Tamil month of Margazhi and Lord Vishnu told Ekadasi that if anyone worships him on that auspicious day, they will reach heaven or the Vaikuntha. The devotees, particularly the Vaishnavites, observe fast and do not eat rice on Ekadasi day as Muran is believed to be dwelling in Rice on this auspicious day to find a way to enter heaven. Considering the same story from a spiritual angle, Muran represents the worldly pleasures and characters that humans normally have such as greed, lust, inertia, arrogance etc. When people win over these characteristics they become Satva which directs them towards Moksha. While fasting helps us to refrain from indulging in many pleasures, observing night vigilance makes us more alert and aware of our mind. If we eat rice, we may sleep off and hence, not eating rice helps keep stay awake during the night to keep vigil. Another myth associated with Vaikuntha Ekadashi is that during the Kurukshetra War, on this day, Krishna had the most important conversation with Arjuna which we all know as the Bhagavat Gita. So essentially, it was on this day that Arjuna attained the highest level of enlightenment. The 11th day of every fortnight in a lunar month is observed as Ekadashi. So every Lunar month has 2 Ekadashis – the bright one and a dark one. According to Rigveda, the sun is called Atmakaraka, meaning the soul of the man and the soul of the Universe. The sun and the moon hold high importance in the Vedas and on the Ekadasi day these two celestial elements can influence the human mind to the highest effect because of their astronomical positions. That’s the reason, meditation is observed by the Yogis and devotees on the day of Ekadasi. Though the fast has nothing to do with attaining high levels of concentration, it keeps the body light during the meditation. When you observe Ekadasi, your soul and spirit are in perfect alignment with your astral planets. The meditation observed on this day helps considerably to improve your concentration, though you may not realize it easily. 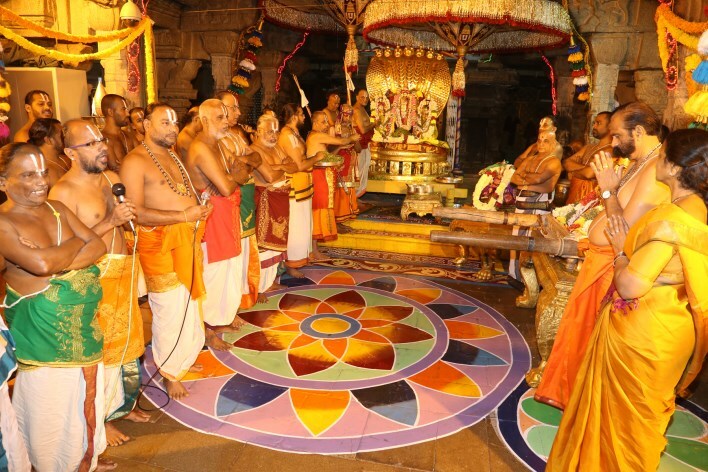 Special prayers and rituals are held in Vishnu temples across the world on Vaikuntha Ekadasi. 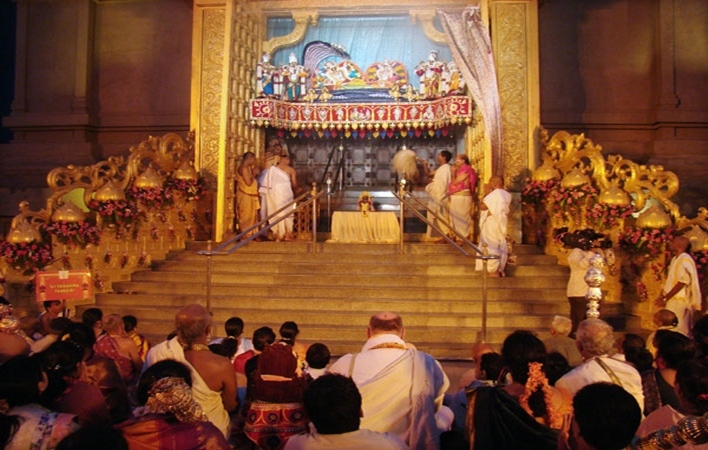 Many temples also make a heavenly gate-like structure to represent the Vaikuntha Dwar. Fasting starts from the previous night of Ekadashi. Those who plan to observe the Vaikuntha Ekadashi fast skip the previous night’s dinner to prepare them for the Ekadashi Vrat. They fast the entire day and keep vigil chanting Vishnu’s slokas or songs. Some engage in long meditation. The next day early morning, they visit the Vishnu temple which completes their observance of Vaikuntha Ekadashi. While complete fasting is observed on Vaikuntha Ekadashi, those ailing from Diabetics or other diseases and having to eat medicines will find it very difficult. They can observe Partial Ekadashi after consulting with their physicians. They can have wheat porridge with milk or water and a pinch of salt. Another option is to have Sabudana Khichdi with groundnut and potatoes but without onion and garlic. This will help them survive without indulging in non-Satvik food. As such Satvik food has a lot of restrictions on many food items. Rice has to be totally avoided. This will include all varieties of food made with rice like Akki roti, Dosa etc. Apart from that, grains and flours made from grains except for wheat, all leafy vegetables, cream, cottage cheese, all types of packaged food, onions, garlic, eggs, fried snacks, honey etc. are all restricted. Pulses are also not to be eaten on Ekadashi day. Those observing partial Ekadashi can have milk, nuts, fresh fruits and vegetables except onion and garlic. You can drink a lot of water. Fresh black pepper, turmeric, ginger, and pure salt can be used on an Ekadashi day. Asafoetida or hing, cumin, sesame seeds, mustard, fenugreek, tamarind, cardamom, nutmeg, cloves, ajwain, and fennel are not used on Ekadashi.